I can’t say today has been my most successful walking experience ever. The B&B Rachel and I stayed in last night was lovely – a huge Georgian house with beautifully proportioned rooms. It is a working farm so we woke at 5am to the sound of cattle. We had arranged for Tony the Taxi to pick us up at 8.30 to drop me back at Portloe, and take Rachel on to St Mawes to get the ferry across to Falmouth. 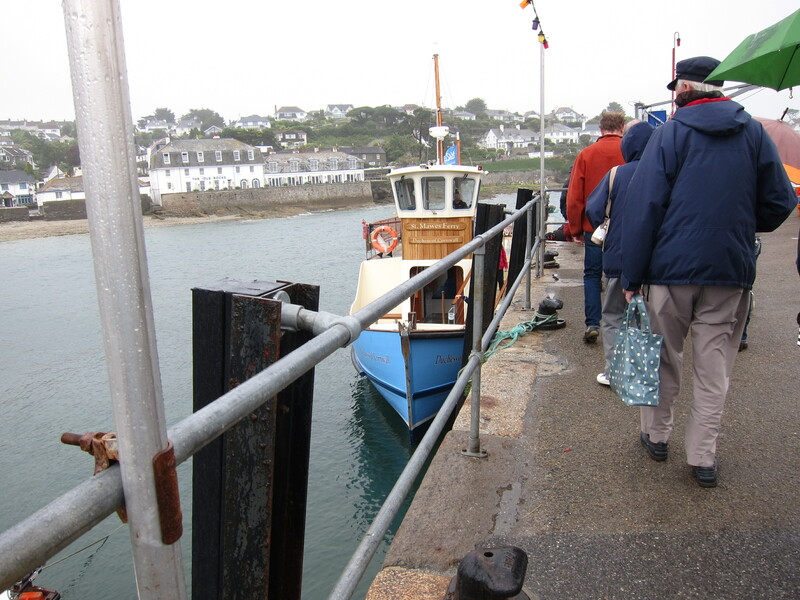 I was on a tight schedule to get to St Antony’s Head to take the Place Ferry to St Mawes – last one at 17.45 for last Fslmouth ferry at 18.00. Given our performance over the last few days, I needed to crack on. 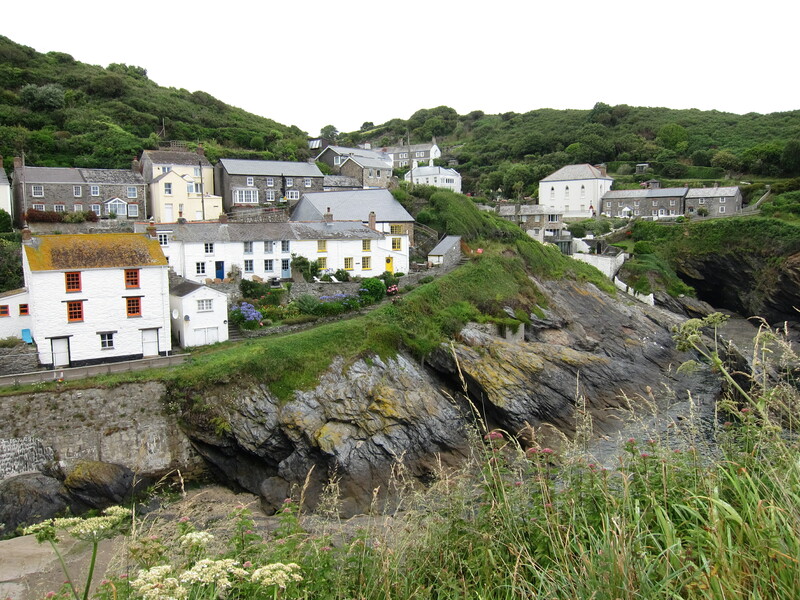 The terrain as far as Portscatho, which was just over half way, looked similar to yesterday, with much easier walking thereafter. Total planned was about 13.5 miles, same as yesterday. I set off briskly enough. The usual lack of signposting nearly took me on “dangerous unfenced cliff-path” as several signs announced. Fortunately I spotted the coast path lurking behind a hillock, so I turned my back on “dangerous” and strode off confidently. The weather was poor. Endless mizzle – not wet enough for waterproofs but making the paths greasy and hiding the view. Tony the Taxi had told me to look out for a coffee shack, called the Hidden House around one of the headlands, but, sadly, it lived up to its name, so no morning coffee. 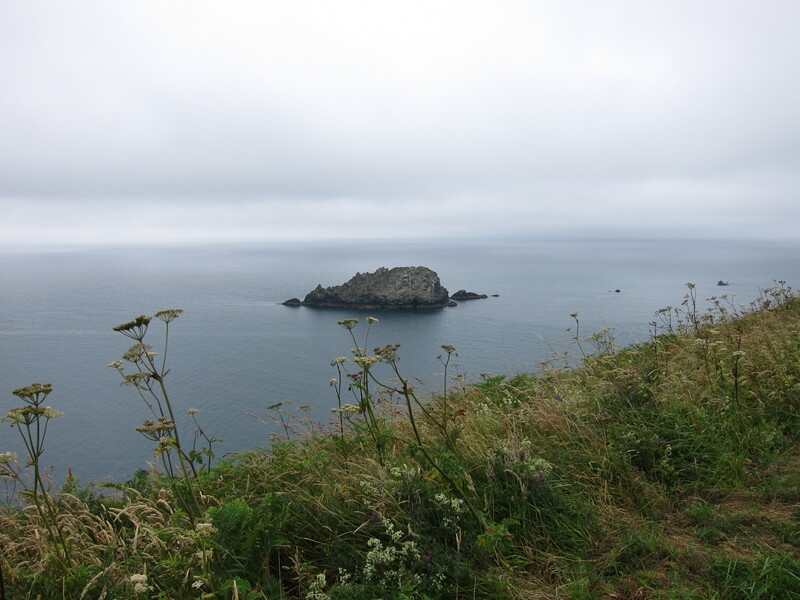 I met a chap coming west to east – obviously a coast path walker. We stopped and chatted – to be honest, after ten minutes, conscious of my schedule, I was twitching to get away. I’d just said good bye when he asked how I felt about cattle. It suddenly dawned on me that he was talking about today. I snapped to attention. ‘Really? Where?’ He pointed the field out on the map. I expressed some doubt as to there being calves at this season, but he assured me that, unlike sheep, cows can calve at any time. I was not convinced that his knowledge of the reproductive habits of cattle was accurate, but that wasn’t really the point. I considered the detour he pointed out. Hmm – a long way round. I decided to go to the field edge and investigate the relative location of cows and stiles. As I was approaching the field, I saw two other people coming toward the suspect field, from the detour path. I broke into a run to head them off at the stile. If I went through on their coat tails, I should be fine. I raced up to them and began to follow. I apologised for stalking them and explained that I had been warned the cows in that field were a bit troublesome. Then the man said, in German, ‘Young steers’. ‘Young bulls’ he said, to me. We agreed they could be a bit too playful. 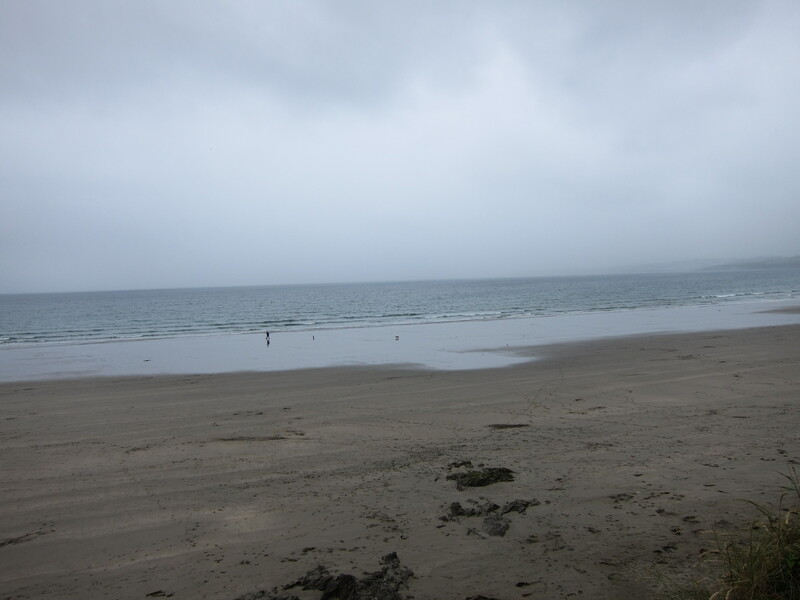 With three of us, however, there were no problems, and I dropped down into Roseland Bay. Then came a very annoying lack of signage. Three paths and no signs. I picked the right one, decided after a few hundred yards that it was the wrong one, retraced my steps. Tried a second, which soon seemed wrong, as it went too far inland, returned to the junction and was scratching my head when two American cyclists appeared. They told me that there was an acorn sign a few hundred yards up. We agreed the signage was terrible. I was now concerned about time, so began to hurry. This was a big mistake. The path was greasy and I went down head first, or rather knee first. I fell with some force and hurt my knee and ankle. Not seriously but enough to make myself very uncomfortable. I carried on, feeling very stiff. More signage issues. Three paths with no acorn. This time I made the wrong decision. Eventually, I emerged on a road above Portscatho. I limped along, crosser and crosser, wondering if I could get a bus as my knee throbbed painfully. I contemplated phone Tony the Taxi, but, no phone signal of course. Just as I crawled into the village, I saw someone waving. Unbelievably, it was Tony Taxi himself, just emerging from a café. 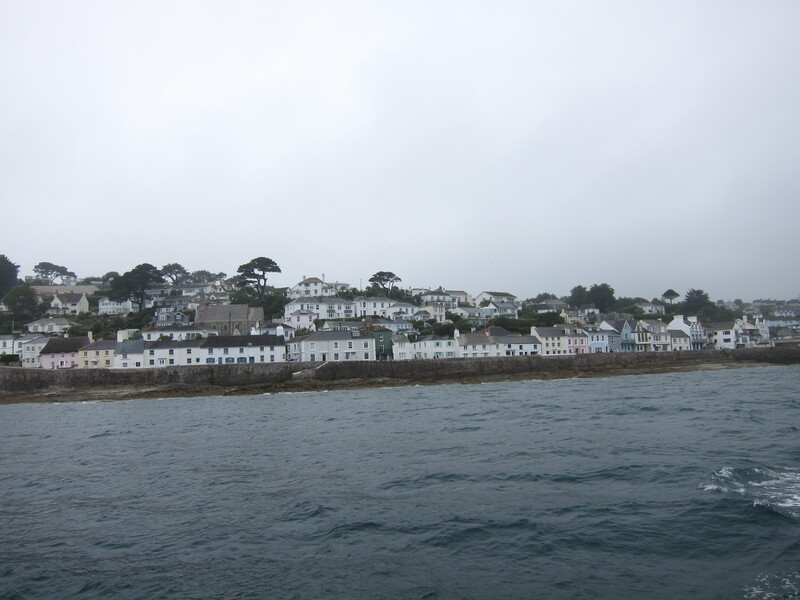 I leapt in to the car and he conveyed me quick smart to the ferry at St Mawes. Bless him, he didn’t even charge me. I took a very wet and windy trip across Falmouth Harbour. It is quite a sight – ferries, pleasure craft, yachts, all zooming in and out of Carrick Roads where the Fal, Kennal, Truro and a couple of smaller rivers converge. Apparently, Falmouth is the deepest harbour in Western Europe, and probably the third deepest in the world. On either side lie Henry VIII’s great fortresses at St Mawes Castle, and Pendennis Castle (one of the last royalist strongholds to fall in the Civil War.) There is some superb housing overlooking the harbour too. Heading towards my hotel, I tried to get new boots – the soles on mine have worn too much, I am not getting enough grip for the slippery surfaces. Unfortunately, I couldn’t find any to fit. Maybe in Penzance. This entry was posted in Cornwall and tagged Castles, Cows. Bookmark the permalink.